A heavy duty but easy to manoeuvre multi-purpose cart ideal for a wide range of tasks in and around the home, garden or allotment. It can be used as a garden trolley or a flatbed carrying platform. It also has a removable soil-plastic liner tray which can turn the cart into a tipping trailer, perfect for carrying loose materials such as compost or sand. It’s durable powder-coated heavy-guage steel frame is long-lasting and ideal for large gardens and with its 300kgs load capacity it will happily take large loads. Easy to assemble it is also easy to use with the handle that can either be pulled or towed. 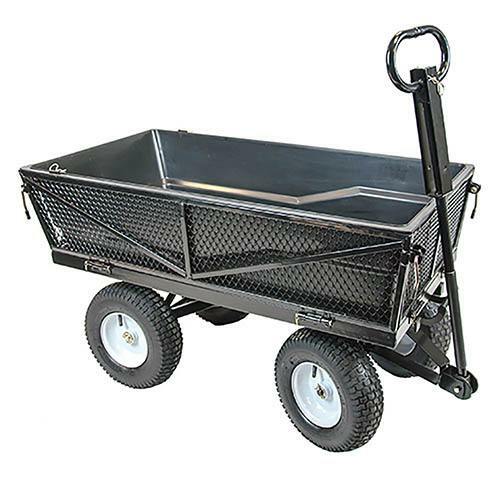 The Handy heavy duty, multi-purpose cart is highly versatile and can be used as a garden trolley or a flatbed carrying platform. It also has a removable soil-plastic liner tray which can turn the cart into a tipping trailer, perfect for carrying loose materials such as compost or sand. It’s durable powder-coated heavy-guage steel frame is long-lasting and ideal for large gardens and with its 300kgs load capacity it will happily take large loads. Easy to assemble it is also easy to use with the handle that can either be pulled or towed. The easy steering offers effortless manoeuvrability. The trolley will come flat packed with instructions for simple assembly.